Saint-Simon’s “new Christianity” was a vision of a society that practiced the teachings of Jesus by devoting itself to the betterment of its least fortunate members. Saint-Simon rejected many of the doctrines and rituals which had been developed by the Christian churches and returned to the words of Jesus in the New Testament. He developed a concept in which the state owned and administered the means of production for the benefit of all. Later thinkers took these concepts in two directions, Christian socialism and atheistic communism. Claude Henri de Rouvroy, comte de Saint-Simon, was born in Paris, France, October 17, 1760, to an impoverished aristocratic family. His grandfather’s cousin, the duc de Saint-Simon, had written a famous memoir of the court of Louis XIV. Henri was fond of claiming that he was a descendant of Charlemagne. At an early age Saint-Simon showed a certain disdain for tradition; at thirteen he refused to make his first Communion and was punished by imprisonment at Saint Lazare, from which he escaped. He claimed his education was directed by D'Alembert, though no proof of this exists; likely Saint-Simon himself invented this intellectual pedigree. After being educated by private tutors, he entered military service at the age of seventeen. From his youth Saint-Simon was highly ambitious. He ordered his valet to wake him every morning with; "Remember, monsieur le comte, that you have great things to do." His regiment was among those sent by France to aid the American colonies. He served as captain of artillery at Yorktown in 1781, was later taken prisoner and freed only after the Treaty of Versailles. Before leaving America, he presented to the Viceroy of Mexico a plan to connect the Atlantic and the Pacific by a canal, and he devised another scheme to construct a canal from Madrid to the sea. He remained in France during the French Revolution (1789), and bought up newly nationalized land with funds borrowed from a friend. During the Reign of Terror, he was imprisoned in the Palais de Luxembourg, and emerged extremely wealthy because the value of Revolutionary currency had depreciated. Saint-Simon lived a life of luxury, entertaining prominent people from all walks of life at his lavish and glittering salons. Within several years he was on the point of bankruptcy, and began to study science, taking courses at the École Polytechnique and acquainting himself with distinguished scientists. His first published work, Lettres d'un habitant de Genève à ses contemporains (1803; Letters of an Inhabitant of Geneva to His Contemporaries), proposed that scientists should replace priests in the social order, and that the property owners who held political power could only hope to maintain themselves against the propertyless if they subsidized the advance of knowledge. In August 1801, he married Mlle. de Champgrand. Less than a year later he divorced her, hoping to marry Mme. de Staël, who had just become a widow, but she refused. In 1805, completely ruined by his disordered life, he became a copyist at the Mont de Piété, working nine hours a day for £40 a year. He relied on his activities as a writer for his livelihood; failing in this, he lived on the generosity of a former valet, and finally solicited a small pension from his family. In 1823, he attempted suicide in despair. Late in his career, he made the acquaintance of Olinde Rodrigues, who became inspired by Saint-Simon’s social ideas and provided him with a living. When dying, Saint-Simon said to Rodrigues, "Remember that to do anything great you must be impassioned." Claude Henri de Rouvroy, Comte de Saint-Simon, died on May 19, 1825, and was interred in Le Père Lachaise Cemetery in Paris. As a thinker Saint-Simon was not particularly systematic, but his influence on modern thought is undeniable, both as the historic founder of French socialism and as the origin of many ideas that were later elaborated into Comtism. 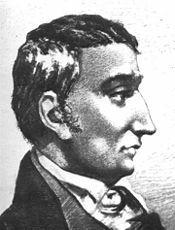 In 1817 he began to propound his socialistic views in a treatise entitled L'Industrie, which he further developed in L'Organisateur (1819), a periodical on which Augustin Thierry and Auguste Comte collaborated. The first number caused a sensation, though it brought few converts. Du système industriel appeared in 1821, and in 1823–1824 Catéchisme des industriels. The last and most important expression of his views is the Nouveau Christianisme (1825), which he left unfinished. The ideas of Saint-Simon for the reconstruction of society were conditioned by the French Revolution and by the feudal and military system still prevalent in France. In reaction to the destructive liberalism of the Revolution, he insisted on the necessity of a new and positive reorganization of society, and went so far as to appeal to Louis XVIII of France to initiate a new social order. In opposition, however, to the military and feudal system, which had been strengthened by the restoration, Saint-Simon advocated an arrangement by which the industrial chiefs should control society. In place of the medieval church, the spiritual direction of society should fall to the men of science. Saint-Simon envisioned an industrialist state directed by modern science, in which universal association should suppress war. He believed that the men who are successfully able to organize society for productive labor are entitled to govern it. The social aim was to produce things useful to life. The conflict between labor and capital so much emphasized by later socialism was not present to Saint-Simon, who assumed that the industrial chiefs, to whom the control of production was to be committed, would rule in the interest of society. Later on he gave greater attention to the cause of the poor, until in his greatest work, The New Christianity, it took the form of a religion. This development of his teaching resulted in Saint-Simon’s final quarrel with Comte. Saint-Simon’s call for a “science of society,” similar to the natural sciences, influenced his disciple Auguste Comte and the development of sociology and economics as fields of scientific study. Thomas Carlyle, Michel Chevalier, John Stuart Mill, Napoleon III, and the young Léon Walras were all inspired by Saint-Simonism. Saint-Simon’s vision influenced French and European society throughout the nineteenth century. Saint-Simon’s “scientism” also influenced the development of Marxist theory. An excellent edition of the works of Saint-Simon and Enfantin was published by the survivors of the sect (47 vols., Paris, 1865–1878). Saint-Simon’s positivist and scientific studies directed him to found a purely practical and demonstrable moral code, while his sentimental and mystical tendencies led him to understand the need for a religion. He believed that Christianity had advanced human morality, but he thought that the reign of Christianity was at an end. His religious tendencies became gradually stronger, until he announced that the world had arrived at the crisis, predicted by the Old Testament, which was to end in the establishment of a truly universal religion, the adoption by all nations of a pacific social organization, and the speedy betterment of the condition of the poor. This vision was developed in "Le Nouveau Christianisme," which was unfinished at Saint-Simon’s death. The views of Saint-Simon had little influence during his lifetime, and he left only a small number of disciples, who regarded him as a prophet and continued to advocate his doctrines. The most important of these followers were Olinde Rodrigues, the favored disciple of Saint-Simon, and Barthélemy Prosper Enfantin, who together had received Saint-Simon's last instructions. Their first step was to establish a journal, Le Producteur, but it was discontinued in 1826. The sect, however, had begun to grow, and before the end of 1828, had meetings not only in Paris but in many provincial towns. In 1828, Amand Bazard gave a "complete exposition of the Saint-Simonian faith" in a long course of lectures in Paris, which were well attended. His Exposition de la doctrine de St Simon (2 vols., 1828–1830) won more adherents. The second volume was chiefly by Enfantin, who along with Bazard stood at the head of the society, but who was more metaphysical in his orientation, and prone to push his deductions to extremes. The revolution of July (1830) brought a new freedom to the socialist reformers. A proclamation was issued demanding the community of goods, the abolition of the right of inheritance, and the enfranchisement of women. Early the next year, the school obtained possession of the Globe through Pierre Leroux, who had joined the school. It now numbered some of the ablest and most promising young men of France, many of whom were pupils of the École Polytechnique which had caught its enthusiasm. The members formed themselves into an association arranged in three grades, and constituting a society or family, which lived out of a common purse in the Rue Monsigny. Before long, however, dissensions began to arise in the sect. Bazard, a man of logical and more solid temperament, could no longer work in harmony with Enfantin, who desired to establish an arrogant sacerdotalism and had lax notions about marriage and the relation of the sexes. After a time Bazard seceded, followed by many of the strongest supporters of the school. A series of extravagant entertainments given by the group during the winter of 1832 reduced its financial resources and greatly discredited its public reputation. The group finally moved to a property owned by Enfantin in Ménilmontant, where they lived in a communistic society, distinguished by a peculiar dress. Shortly afterward the leaders were tried and condemned for proceedings prejudicial to the social order; and the sect was entirely broken up (1832). Many of its members became famous as engineers, economists, and men of business. The school of Saint-Simon advanced and clarified the vague and confused views of the master. They identified two types of epochs in the philosophy of history; the critical, or negative, and the organic, or constructive. The critical epochs, in which philosophy is the dominating force, are characterized by war, egotism, and anarchy. The organic epochs are dominated by religion, and marked by a spirit of obedience, devotion, and association. The two spirits of antagonism and association are the two great social principles, and the character of an epoch is determined by the one which prevails. The spirit of association, however, tends more and more to prevail over its opponent, extending from the family to the city, from the city to the nation, and from the nation to the federation. This principle of association is to be the basis of the social development of the future. Under the present system the industrial chief exploits the proletariat, the members of which, though nominally free, must accept his terms under pain of starvation. The only remedy for this is the abolition of the law of inheritance, and the union of all the instruments of labor in a social fund, which shall be exploited by association. Society thus becomes sole proprietor, entrusting to social groups and social functionaries the management of the various properties. The right of succession is transferred from the family to the state. The school of Saint-Simon strongly advocated a social hierarchy in which each person would be placed according to his capacity and rewarded according to his works. Government would be a kind of spiritual or scientific autocracy. The school of Saint-Simon advocated the complete emancipation of women and her entire equality with men. The "social individual" is man and woman, who are associated in the exercise of the triple function of religion, the state and the family. In its official declarations, the school maintained the sanctity of the Christian law of marriage. Connected with these doctrines was a theory of the "rehabilitation of the flesh," deduced from the philosophic theory of the school, which rejected the dualism emphasized by Catholic Christianity in its mortification of the body, and held that the body should be restored to its due place of honor. This theory was unclear, and its ethical character differed according to various interpretations given to it by different members of the school of Saint-Simon. Enfantin developed it into a kind of sensual mysticism, a system of free love with a religious sanction. comte de saint-Simon/ Markham ed. Henri Comte de Saint-Simon 1760-1825 Selected Writings. Blackwell Oxford, 1952. Saint-Simon and Saint-Simonism Catholic Encyclopedia article. History of "Henri de Saint-Simon"
This page was last modified on 15 December 2017, at 15:31.